With a stay at Colonna Country & Sporting in Arzachena, you'll be within a 15-minute drive of Capriccioli Beach and Gregoland. 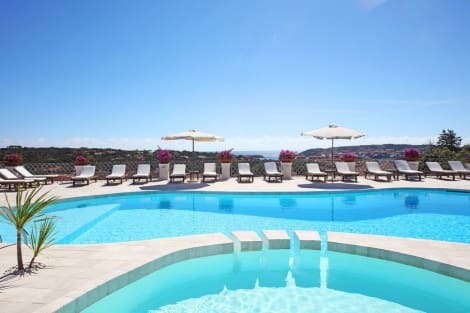 This 4-star hotel is 16.8 mi (27 km) from La Marinella Beach and 0.6 mi (0.9 km) from Marina di Porto Cervo. Satisfy your appetite with Italian cuisine at beach bar, a beachfront bar which features an ocean view. Dining is also available at the coffee shop/café. Wrap up your day with a drink at the beach bar. Buffet breakfasts are available daily from 8:30 AM to 10:30 AM for a fee. With a stay at Hotel Balocco in Arzachena, you'll be within a 15-minute drive of Capriccioli Beach and Stella Maris Church. This 4-star hotel is 16.7 mi (26.8 km) from La Marinella Beach and 1.1 mi (1.7 km) from Gregoland. Make yourself at home in one of the 53 individually decorated guestrooms, featuring minibars and LCD televisions. Complimentary wireless Internet access keeps you connected, and satellite programming is available for your entertainment. Private bathrooms with showers feature rainfall showerheads and complimentary toiletries. Conveniences include phones, as well as safes and desks. Grand Hotel in Porto Cervo is a 4 star hotel in Porto Cervo, the heart of the Costa Smeralda, in Northern Sardinia. The hotel is located within a 25,000 m² National Park where aromas of myrtle and juniper are found, with the beautiful colours of water and fine sands of the bay of Cala Granu. At Grand Hotel in Porto Cervo, you can choose from a variety of elegant and diverse accommodation options, providing you and your family with a comfortable stay.The 4 star hotel offers guests a fantastic pool with a smaller children’s pool, and also two hydromassage tubs overlooking the beautiful bay of Costa Gallurese .The quality of the excellent food and refinement of the bars are the flagship of our hospitality. At Grand Hotel in Porto Cervo, you can also take part in sports, simply relax, or get involved in a variety of activities, go on exciting trips or get involved with sport and fitness. The high quality of our services is harmonious with the blissful surrounding area. A stay at Relais de la Costa places you in the heart of Arzachena, a 3-minute drive from Stella Maris Church and 5 minutes from Piccolo Pevero Beach. This 4-star hotel is 4.1 mi (6.6 km) from Aquadream and 4.4 mi (7.1 km) from Pevero Golf Club. Featured amenities include a 24-hour business center, limo/town car service, and complimentary newspapers in the lobby. Event facilities at this hotel consist of a conference center and a meeting room. A shuttle from the hotel to the airport is provided for a surcharge (available 24 hours), and free self parking is available onsite. Located in Arzachena, Hotel le Palme is on the waterfront, within a 10-minute drive of Stella Maris Church and Aquadream. This 4-star hotel is 7.1 mi (11.4 km) from Capriccioli Beach and 17.6 mi (28.3 km) from La Marinella Beach. Spend the day on the private beach or dip into one of the 2 outdoor swimming pools. Additional features at this hotel include complimentary wireless Internet access, concierge services, and babysitting/childcare (surcharge). Spend the day on the private beach or dip into one of the 2 outdoor swimming pools. This Mediterranean hotel also features complimentary wireless Internet access, concierge services, and babysitting/childcare (surcharge). Getting to nearby attractions is a breeze with the area shuttle (surcharge). Enjoy Mediterranean cuisine at Cambusa, a restaurant which features a bar, or stay in and take advantage of the room service (during limited hours). Quench your thirst with your favorite drink at the poolside bar. A complimentary buffet breakfast is included. Set on the beautiful northern tip of Sardinia, the Italian resort of Porto Cervo is the nerve centre of the Costa Smeralda. This famously luxurious and unspoilt area was developed by Prince Karim Aga Khan and a consortium of investors during the 1950s – 1960s. The village is located on the southern and eastern shore of a natural port, where you will find a range of high-end boutiques, bars, cafés and restaurants. 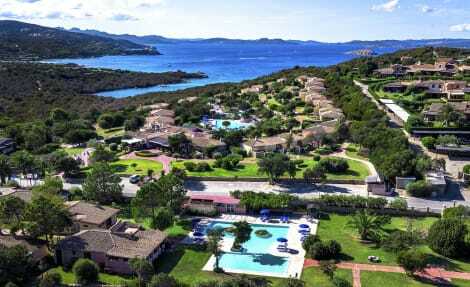 Across the bay are the old and new marinas and the exclusive Yacht Club Costa Smeralda. Many grand and luxurious craft can be seen at mooring here. Surrounding the village is the rugged ancient landscape of the island and miles of perfectly rocky coast, punctuated by small beaches that take you gently to the edge of the sparkling blue-green Mediterranean. It's easy to see why this area was christened the Emerald Coast. Above the harbour front and the glamorous boutiques you can discover Chiesa di Stella Maris. This unique gleaming white church with its distinctive funnel-shaped bell tower was designed by Michele Busiri Vici and often hosts classical concerts on summer evenings. Not far from Porto Cervo is the historically important Compendio Garibaldi on Isola Caprera. This rocky little Island is one of the beautiful Maddelena Archipelago group, and was the home and refuge of Italian hero Giuseppe Garibaldi. Rustic, elegant and atmospheric, there is still a sense of the family home about this museum. From Porto Cervo hotels you can really savour the fruits of the Mediterranean. The village is filled with fine places to eat and naturally fresh seafood takes precedence on most menus. La Briciola fills with locals as well as visitors, which is a very good sign…Superb pizzas, pasta dishes with sea urchin and grilled local fish are just some of the highlights. To really savour the amazing seafood in seriously stylish surroundings, book a SEOSITE_LEVEL_DESCRIPTION at Spinnaker, which you'll find on the road between Porto Cervo and Baia Sardinia.